Pork chops are often a hit-and-miss when it comes to turning them into a nice meal. They are notoriously easy to get wrong: too dry, too hard, or not enough flavor. This has happened to most of us at some point in our cooking lives. But if you use a simple, yet flavorsome seasoning recipe and if you stick to the right cooking time, oven baked bone-in pork chops will become your favorite meal. 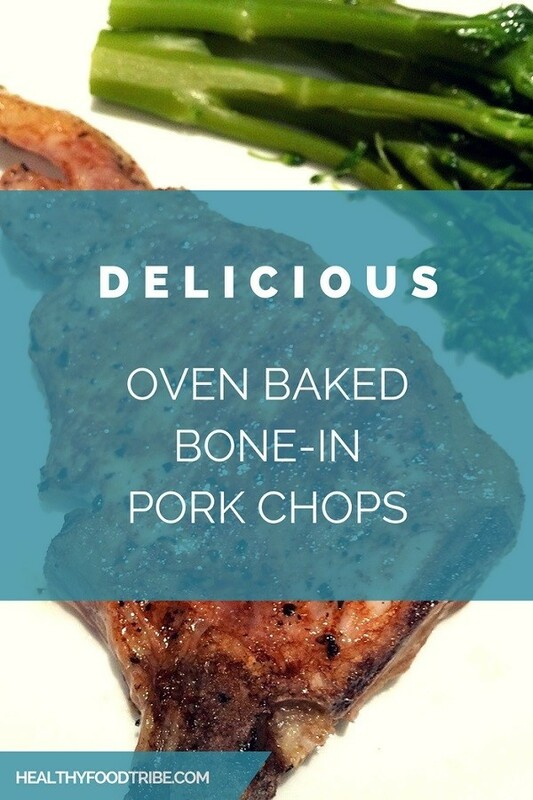 Here is a very quick and easy recipe that will have you serve delicious, juicy pork chops within one hour, with very little effort. So even if you have very little cooking experience, you can still prepare a healthy and delicious meal for you and your family and friends. The combination of soy sauce and raw sugar in this recipe are the secret to adding that special flavor to your oven baked pork chops. This recipe caters for 4 people (or 2 very hungry people). So what goes into this pork chops recipe? Not much, because it really is quite a basic recipe. But the combination of these few ingredients make them taste delicious. Pretty straight-forward right? But as simple as it is, the soy sauce with raw sugar and a few spices works amazingly well. I choose dark soy sauce rather than regular soy sauce, but that’s a personal preference. Please note that it’s important to find pork chops that are the same size, just so that they can be baked evenly. Let’s go through the steps of preparing these oven baked bone-in pork chops with delicious flavors. Preheat your oven to 320 degrees Fahrenheit / 160 degrees Celsius for around 10 minutes. Place a layer of aluminum foil in an oven baking pan and cover the foil with a bit of oil (or spray). A simple oven tray will work too. Rinse the pork chops, dry with paper towel and place them in the pan. Coat both sides of the pork chops with soy sauce until they look nice and brown. Be mindful not to use too much soy sauce as we don’t want to make this the dominant flavor. Sprinkle the black pepper and raw sugar (and the optional salt) evenly over both sides of the pork chops – followed by the paprika. Place the pork chops in the oven and let them bake for 15 minutes. Turn them over and bake for another 15 minutes. Make sure you don’t go over the 15 minutes time-frame because pork chops easily dry out when left in the oven for a bit too long. When both sides are evenly cooked with a light brown color, take the pork chops out of the oven and let them sit for 5 to 10 minutes before serving. Cover the pork chops with aluminum foil while resting. These juicy pork chops will surely satisfy your taste buds, but to maintain a healthy nutritional balance, it’s best to add some vegetables. Personally, I love cooked broccoli or broccolini on the side, or pan-fried mushrooms. What also works well are cooked or grilled (sweet) potatoes with a nice gravy sauce and perhaps some steamed carrots. Or even better, all of the above. The printable version of this recipe is below, simply click the print button and a new window will open. I truly hope you’ll enjoy this oven-baked pork chops recipe! A simple yet powerful recipe for delicious and juicy oven baked bone-in pork chops. Preheat your oven to 160 degrees Celsius (320 degrees Fahrenheit) for 10 minutes. Place a layer of aluminum foil in an oven baking pan and cover the aluminum foil with oil or spray (not too much). If you don’t have a suitable pan, you can simply place the aluminum foil on an oven tray. Rinse the pork chops and dry them with a paper towel and place them in the pan. Coat both sides of the pork chops with soy sauce until they look nice and brown. Don’t use too much soy sauce as we don’t want to make this the dominant flavor. Sprinkle the raw sugar and black pepper (and the optional salt) evenly over both sides of the pork chops, followed by the paprika. Place the pork chops in the oven and let them bake for 15 minutes. Then turn them over and bake for another 15 minutes. Make sure you don’t go over the 15 minutes time-frame because pork chops easily dry out when left in the oven for too long. Try to find pork chops that are about the same size. This is important just so that they can be baked evenly in the same amount of time. Please note that you can vary the amounts of the different ingredients. If you like things sweet, add a bit more sugar. Or if you like a salty flavor, simply add a bit more salt. Keep in mind though that the soy sauce also creates a bit of saltiness and it's best to not overdo it. I would recommend to start this recipe as stated above and apply changes when you try this recipe a second time. Absolutely love this recipe, have prepared it several times now. I really don’t like spending hours in the kitchen, especially after a long day in the office, so this recipe is such a blessing. Thanks for sharing! 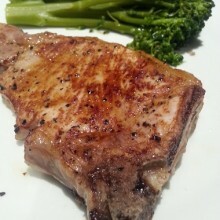 Good pork chop recipe, the soy sauce and sugar add great flavors. I made these oven-baked bone-in pork chops tonite. I really didn’t know what to expect; however, much to my surprise the pork chops turned out very tender, with an entirely different flavor than the usual tasting pork chop. My husband liked them too. I served them with a stir fry of fresh organic carrots and green cabbage; steamed buttered potatoes. So glad you liked the recipe Connie, and thanks for sharing your side dish, sounds delicious! What can I substitute for raw sugar? Hi Nancy, I haven’t tried it but perhaps a bit of honey will work. Or otherwise no added sweetness at all, still tastes great! If I don’t have paprika what else could I use… I have all other ingredients but paprika. Hi Mary, you can probably just try without paprika and see if you like it. Paprika is hard to substitute but you could try ancho powder, chipotle powder or something similar. Hope it works! What is the thickness of the pork chops used? Should time cooked be altered due to the thickness? Hi Debbie, good question, I’d say around 1-1.5 inches? If they’re exceptionally thick then yes I would leave them in the oven a few more minutes, but usually they all have similar thickness. Trying. But only 320 degrees? Hi Jeanette, yes 320 should work, but feel free to increase temperature to 340 or even 360, depending on the thickness of the pork chops. After I took a break from pork, I bought a giant bone-in chop because it’s so cheap. I used your simple seasoning and it was excellent. I had to modify the cooking time and temp but would use it again. Glad you like it, Jane!